Common Diseases and Conditions - Design Tree Maintenance & Landscaping Inc.
Fertilization, Composting, Microinjections What’s Wrong with my Queen Palms? Watering is obviously a very important part of tree maintenance. But when and how much? Trees, in general, prefer slow, deep, infrequent waterings, as opposed to the highly prevalent practice of very frequent, short, shallow waterings. This is particularly necessary in our compact, clay soil. Deep waterings allow proper infiltration and percolation, and also assist in the leaching of salt which can be harmful to your trees. Shallow watering not only prevents good penetration, but allows for the salt that is very present in the water to collect at the surface, adding insult to injury to a soil already high in salt content. It is also important not to allow water to collect at the trunk base. The trunk tissue is very different than that of the roots, and over watering this area can lead to rot and decay, which can lead to health problems and even tree failure. Talk to an arborist about the best watering practices for your trees. Mineral deficiencies are very common to our part of the country, usually with non-native trees. This is due to the nature of our soil and lack of the necessary biological activity that is condusive to allow for proper mineral uptake by these trees. Most common is a condition known as chlorosis, which simply means lack of chlorophyll. When you see younger leaves yellowing, while the veins remain green, this is probably a sign of a micronutrient deficiency, such as iron or zinc. If mature leaves are on the tree are turning completely yellow, this may be a sign of a lack of nitrogen, which is considered a macro-nutrient, that is it is used by the plant in large quantities. Queen palms show manganese and potassium deficiencies by the yellowing and frizzling of their fronds. As with all conditions, preventative maintenance is the best care. This is accomplished with proper watering and feeding. Our organic feeding programs can greatly increase the health and vitality of your trees. 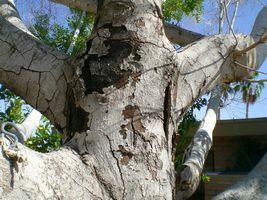 This fungal disease usually attacks smooth bark trees here in the Phoenix desert area, and can commonly be seen on such trees as citrus, mulberry, and ficus. These trees are particularly susceptible to bark sunburn which is the main entry way for this fungus. It also can enter through various wounds in the tree. This disease is very easily spread by wind, rain, birds, insects, and even pruning tools. When the bark eventually cracks as the disease develops, the disease is very well recognized by a black, dusty mass of spores that left alone will kill the sapwood. If the main trunk becomes infected, the tree will die. Pruning the infected branches, and proper future pruning practices, along with proper fertilization, is the only way to prevent and control this disease. 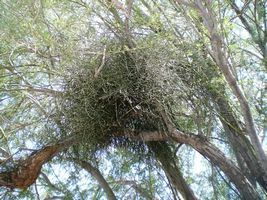 The mistletoe plant, while innocent in appearance, is parasitic to the branches of trees and shrubs. The parasite is usually spread by birds. They eat the berries of the plant and leave their droppings on the branches which begins the infection process. This is also accomplished when the birds wipe their bills on the branches after eating the fruit. The parasite relies on it’s host tree for water and minerals, which drains the tree, causing decline and sometimes death. Once a tree is infected, it is important to closely monitor the tree to prevent it’s spread by immediately pruning when it appears. To keep the tree alive from this point forth, will require constant attention to properly prune and feed the tree to keep it’s vigor. Conks are fruiting bodies very evident on the exterior of a tree. These conks are created by a fungus that attacks the wood tissue causing it to break down and decay, and eventually rot. The presence of conks can indicate massive areas of decay and rotten wood, and even entire spaces that have been hollowed out. This is a very important factor when determining the hazard rating of a tree. Cankers are areas of dead bark tissue usually caused by pathogens such as fungi and bacteria. 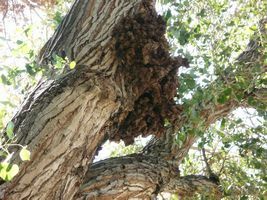 These pathogens cause wood decay and rot, inviting even more hazardous pathogens and pests, causing the tree to decline and sometimes eventually die. The key here is preventative maintenance by keeping your trees healthy. Vigorous, healthy trees respond very quickly to these pathogens when they attack, not allowing them to establish. Gummosis is the production of gummy exudates in reaction to the attack of certain pathogens. This condition is especially common on citrus trees where it is almost always present when there are several of them together. The best maintenance, of course, is preventative, by keeping the tree healthy, but once infected, it can be controlled if caught in time. best care and maintenance program for your trees.